June 2017 — Fellow citizens of the OECS, June 18, 2017, marks the 36th anniversary of the establishment of the Organisation of Eastern Caribbean States (OECS). I am honoured, at this time, to assume the chairmanship of this organisation which has had numerous achievements over the course of its existence. Our grouping of tiny states has, against all odds, successfully established the Eastern Caribbean Central Bank, Eastern Caribbean Supreme Court, Eastern Caribbean Civil Aviation Authority and the Eastern Caribbean Telecommunications Authority. We have a mechanism for joint procurement of pharmaceuticals in the form of the Pharmaceutical Procurement Services Unit. In our diplomatic relations, we benefit from joint representation to the European Union and share a technical mission in Geneva which represents our interests in the WTO. We established the Eastern Caribbean Common Market and have developed and effected joint policies in such areas as trade, foreign affairs, education, human and social development and environmental management. We approach, together, our participation in various regional and international arrangements including the Caribbean Community (CARICOM), the Association of Caribbean States, the United Nations as well as its specialised agencies. In January 2011, the entry into force of the Revised Treaty of Basseterre paved the way for deeper integration through the formation of an economic union. This bold venture re-configures OECS Member States into a single financial and economic space, characterized by the free movement of people, free circulation of goods, unfettered movement of capital and the right to provide services and establish businesses throughout the economic union area. Of these new undertakings, we have, in recent times, made significant strides in securing freedom of movement for our citizens and work continues on the elaboration of the other aspects of the economic union regimes, as well as the pursuit of functional cooperation arrangements and membership expansion under the Revised Treaty. While we take pride in these achievements and in the pace of our integration movement generally, we cannot rest on our laurels. The international environment in which we operate is constantly evolving and, consequently, we must direct our collective future effort towards addressing head-on the novel challenges which this presents. Our Member States rank among the smallest countries in the world and we are no strangers to the vulnerability and external shocks. 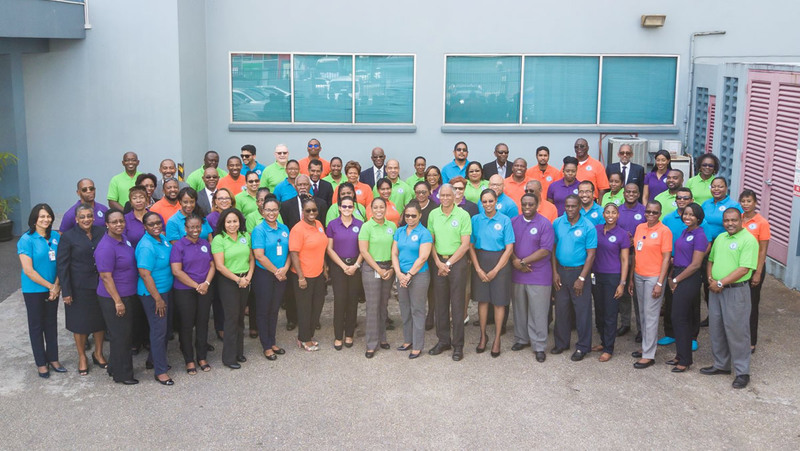 This notwithstanding, the OECS celebrates its 36th anniversary at a time when the world is in a particularly heightened state of flux; and unpredictability is the order of the day. One of the consequences of globalization is that today we are much less insulated from the impact of world events. In our quest for development and the modernization of our societies, we have to navigate difficult, sometimes hostile terrain. The Revised Treaty of Basseterre provides us with the means to do so, by way of deeper economic integration and more extensive functional cooperation. At this juncture, not only must we give more focused attention to the implementation of that contract, but we must do so in a manner which is strategic, innovative and fearless. As individual citizens and as a community of nation-states and territories we must leverage this integration movement to tackle our problems of high indebtedness, low employment, poverty, crime and security, climate change, food security, health-related challenges, inactivity in our private sector and adverse conditions of trade and international commerce. In our international relations, we are witnessing changes in the administration of some of our traditional partners, of note being the United States, the United Kingdom and France. Moreover, the United Kingdom, a strong Caribbean partner, will be withdrawing from the European Union at a time when our Member States will be involved in negotiating a successor to the Cotonou Agreement which has governed development cooperation between the European Union and the African, Caribbean and Pacific Group of States since 2000. In this climate of uncertainty, the OECS is called upon to re-engage our partner countries and organisations in an attempt to secure the continuation of our long-established relationships and to deepen existing bonds in mutually beneficial ways. At the same time, we recognize that we must assert ourselves internationally and extend our diplomatic outreach to new partners who pursue common objectives and adopt principles which are consistent with those of the OECS. In all instances, we must ensure that we design new partnership arrangements which take cognizance of our peculiar characteristics and needs as small island developing states. With respect to the environment, we face myriad challenges which are linked to climate change and which threaten our very existence as countries. We witness the continued rise in temperatures and sea levels, unprecedented rainfall patterns, more intense storms and drought conditions. Combating climate change and increasing our resilience must, therefore, be high on the agenda of the OECS. Security is yet another major concern for our region. While integration and the free movement of people, capital and goods may foster economic gain, they also have the potential to increase our vulnerability. We must work to enhance the security of our single space, to combat cross-border crime and to guard against the threat posed by the spread of intolerance and extremism. In all of our responses, the development of our people is pivotal. Our citizens should be able to function as social and economic actors within a truly single OECS space and to use that area to launch themselves into the international arena. In order to achieve this, singular effort must be made to design education systems which support market demands, which maximize the use of modern technologies and which, ultimately, produce wholesome OECS citizens. The landscape is perpetually shifting. In order to remain relevant, the OECS must be anticipatory and nimble, furnishing the Member States with the mechanisms for growth and sustained development which, individually, they cannot provide for themselves. Fellow citizens, as we move forward with our integration agenda we encourage everyone to be full participants and owners of our OECS. Through our joint efforts, we can consolidate our economic union achievements, elaborate the legal and institutional architecture necessary for people and businesses to move freely; for ideas to co-mingle and cross-fertilize; for innovation to flourish and, in the language of the Revised Treaty of Basseterre, for the OECS to ‘build on our common history for the benefit of our peoples’. We must act now; we must act decisively. Acceptance of any contribution, gift or grant is at the discretion of TDN Radio. TDN Radio will not accept any gift unless it can be used or expended consistently with the purpose and mission of TDN Radio. TDN Radio will refrain from providing advice about the tax or other treatment of gifts and will encourage donors to seek guidance from their own professional advisers to assist them in the process of making their donation. TDN Radio will accept donations of cash or publicly traded securities. Gifts of in-kind services will be accepted at the discretion of TDN Radio. Certain other gifts, real property, personal property, in-kind gifts, non-liquid securities, and contributions whose sources are not transparent or whose use is restricted in some manner, must be reviewed prior to acceptance due to the special obligations raised or liabilities they may pose for TDN Radio. TDN Radio will provide acknowledgements to donors meeting tax requirements for property received by the charity as a gift. However, except for gifts of cash and publicly traded securities, no value shall be ascribed to any receipt or other forms of substantiation of a gift received by TDN Radio. TDN Radio will respect the intent of the donor relating to gifts for restricted purposes and those relating to the desire to remain anonymous. With respect to anonymous gifts, TDN Radio will restrict information about the donor to only those staff members with a need to know. TDN Radio will not compensate, whether through commissions, finders' fees, or other means, any third party for directing a gift or a donor to TDN Radio. TDN Radio keeps you informed and entertained. Music, news and information you can use. Copyright © 2009-2019 TDN Radio. All Rights Reserved.